Chid Liberty is the co-founder and CEO of Liberty and Justice, a social enterprise in Liberia which employs women in the garment industry. As he explains to Caroline Hartnell, it’s not just a matter of providing incomes for poor women in an African country at one end and T-shirts for customers in the US at the other: the women he employs need training and support in every aspect of their lives. This training couldn’t have been provided without grant support. Yet for Chid Liberty, one of the ironies of what he’s doing is that so many philanthropists and impact investors don’t see job creation as something to invest in. Can you tell me about how Liberty and Justice got started? What was involved in its founding and development? It started with two investments from my business partner and myself in the holding company, which is a US for-profit with African subsidiaries. We also had a counterpart in Liberia, a local corporation, which is 49 per cent owned by the workers and co-managed with local and international experts. We also started a non-profit organization. One of the reasons for starting the non-profit was that we were going to be making a lot of investments in traditional workforce capacity: how to use a sewing machine; why it’s important to come to work on time, etc. Our workers are internally displaced women who are now becoming heads of households and wage earners, so there are also many things that they need to understand about financial planning and managing their families’ lives and so on that they were asking us for. Liberty and Justice, the for-profit, has always been willing to make investments in workers, but when it came to making investments like this, we needed grants. So we started working with grantmakers and devised this idea of a hybrid structure, a for-profit and non-profit, both independently governed but working towards the same thing, job creation, and making sure our workers were successful in both their professional and their private lives. To go back one step, why did you start Liberty and Justice in the first place? 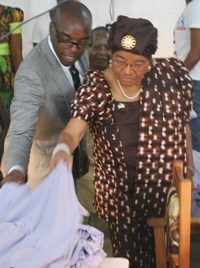 My business partner, Adam, and I started it because we became completely enthralled by the women’s movement in Liberia. We thought it was one of the most significant women’s movements and probably one of the most significant social movements. People who were considered completely powerless by their society at the time actually played a big role in ending the war and getting rid of a president and replacing him with the first female president in African history. As someone from Liberia who hadn’t lived there for nearly 30 years, I was really keen to see what I could do. So my best friend and I put up the seed capital to go back and research what we wanted to do. Our starting point was that we wanted to work with grassroots women’s groups, so we started meeting women in the IDP [internally displaced person] camps, the leaders of the women’s organizations, and devised the garment factory scheme. So you’d actually formed Liberty and Justice with your seed capital before you’d decided exactly what it was going to do? We knew that we wanted to do something in private sector development and we knew we wanted to create jobs for women, and then we started looking at which industries we could target. So we didn’t go in completely without ideas. We think that’s part of the problem. The pendulum of philanthropy has swung from completely top-down, western-run projects to a let’s-localize-everything approach. A story that I like to tell is about our fair trade premiums, which is money that is paid directly into a fund managed by the workers. Well, we got our first fair-trade premiums, and I suggested we put them in our savings match programme – this is a fantastic savings programme, where every dollar a worker saves is matched after a year. But the women said, no, we want to give the money to God, by which they meant their pastors and our Imams. I had a vote in that decision, but not a majority vote as I do on some affairs in the factory, so that’s what we had to do. For me, it wasn’t a great decision, and I think that’s the risk of localizing too much! If everything was decided in that way you might end up with no jobs! And some very wealthy pastors and Imams! Which I think is the condition we found when we got there. So my business partner and I raised a seed round of investment, about $600,000, which came from a mixture of friends and family and also one larger institutional impact investor, Josh Millman of the Serious Change fund. What kinds of return were the friends and family looking for? They got that it was an impact opportunity but most of them were actually sold on the business opportunity. Let’s put it this way: I don’t think they were investing purely for impact, I don’t think they were investing purely for financial returns, I think they were investing in Adam and me, that was it. You mentioned some foundations that made grants but also took out equity investments? Humanity United is one that’s done both. They made a technical assistance grant for $30,000 and then bought equity, both through different intermediaries. And what about fully commercial funding? We’ve had what I’d call impact-first investors – Root Capital, Eleos Foundation, Humanity United – and now we’re moving on to the next link in the chain with investments from finance-first impact investors. It’s still impact finance, but it’s finance-driven impact. The next stage is purely commercial investors who are looking at our business model and seeing the growth opportunity. We haven’t closed any of those yet but there’s interest. Does the non-profit provide the business skills as well as life skills? Absolutely. There’s a six-part training programme. The first two parts are basically an investment in the person: it’s all about creating a vision for the company, for our community, for the world, and it’s based on the vision-action-commitment workshop done by the Hunger Project. After that, there are two months of very intense sewing training, followed by management training. In these first two courses, a lot of things about business and about the company in particular are explained, so workers learn about things like profit and loss and dividends and so on – since they own 49 per cent of the business, they need to understand what that actually means. Then there’s a management course for those who are going to be entering management. Then there’s an entrepreneurship course. The majority of the women either use part of their income to run a micro-enterprise or they fund their family to do it. The president of our workers’ association started a provision shop from her wages and has her two sons selling rice during the day while she’s at work. One woman in our savings programme saved 80 per cent of her income, and with the other 20 per cent she and her husband bought coal and started a coal micro-enterprise. Some of them are very skilled business people and we try to give them support services. I gather that there are some unintended consequences, like the divorce rates going up? It’s the opposite of what we intended, because we have a culture of healthy families and healthy communities. However, while some of the stories are just about two people separating like anywhere else in the world, some come from what was a pretty abusive situation. One day, Marianna, a very quiet Muslim woman and a diligent worker, came in; she wasn’t wearing her headscarf and told me she needed to change her bank account. We have an HR person and an accountant, but she came to me because I think she just needed to talk. I asked her what was going on and she said I’m getting a divorce. I thought it would be a question of changing her last name but she said, no, I need to change my first and last name. My real name is Rebecca and I was forced to marry a man when I was 13 years old who was decades older. She was now in her forties; she had been with him all of that time but she decided now was the time to split up. I can’t imagine at 13 being forced to change your name, your religion, your culture and then having the courage in your forties to take it all back. How many women do you have in your factory now? Do you see opportunities to set up more factories? We’re exploring our growth strategy at the moment. We took over a factory in Ghana for a while and just turned it back over to the owner. At one point we thought we might try to set up 15 or so factories. Bain Consulting have given us an ‘extern’ for six months and she’s helping us develop a business model for a concept called Made in Africa. Instead of buying and building factories, we’re thinking of partnering with factories, building their capacity through those wonderful six courses that I told you that we came up with, then offering them additional management training and access to finance so that they can upgrade their facilities. In Liberia, for instance, we were able to cut our electricity bill in half by using energy-efficient motors. We can also be the market linker. We signed $40 million of annual MOUs in 2011. We haven’t had the capacity to serve those clients yet because it just takes a very long time, so our hope will be to bring in really big buyers, match them with other factories, and help those factories get up to the standards the buyers are looking for. Are there others in Liberia doing the same sort of thing? Yes, in fact we’ve helped to start two factories and we’re equipping both of them if everything works out right. One is owned by a very wonderful Liberian social entrepreneur outfit it’s called Jola House Creations. They make African batik bags for export. Another one is run by one of the Coopers, I think Bernice Cooper. Do you see the model you’re talking about as a way of making a real difference in Africa if it was widely adopted? Absolutely. The strategy is to look at job creation. African countries aren’t going to be the next China, but there’s a really interesting opportunity in Africa. For us, more than anything, there was the opportunity to build a garment industry almost from scratch. Instead of some of the issues that we’re seeing in Bangladesh with factories falling down, we can actually build compliant factories, what we call factories 2.0 or future factories. What are the barriers to this happening? One is capital and the other is the entrepreneurs. Entrepreneurs are saying there’s no capital; financiers are saying there aren’t any entrepreneurs. What we’re trying to say is here’s a tested market that has worked over time to lift people out of poverty; here’s a stack of capital that wants to come in but is scared to be the first mover; and here are entrepreneurs who with a little bit of help can get up to the standards the buyers want. So if we can work with impact investors and philanthropists to help build the producers’ capacity while at the same time getting the investments started so the private equity people can see some things that are working, then we’ve achieved our mission. And we think there’s billions of dollars in capital and a great group of entrepreneurs to support. Do you foresee the need for the non-profit training element that you’ve had in Liberia in all these different industries? And if so, would you still need the philanthropic input to provide that? Absolutely. When you talk to any company entering Africa, their biggest problem is human capital. We’re huge believers that Africa’s best natural resource is actually people, but we need to make investments in them. The reason we can start back in Africa now and it couldn’t have happened 30 or 40 years ago is that at least the percentage of people with primary education in Liberia and in Africa generally is higher. So we’re making investments and they’re paying dividends towards industrialization and poverty alleviation. We need to continue to make those investments. The market is not going to solve those problems. Will Liberty and Justice’s training school need ongoing philanthropic input or will it run itself? The way that we designed it is that some dividends from the factory go back into the non-profit so it almost becomes like a corporate foundation, but to get it started we absolutely needed grants. Do you see differences in your approach to investing to the generation above you? Yes, definitely. There’s very little on which I disagree with President Sirleaf, but I hear leaders in Africa talking a lot about Africa’s wealth in natural resources and how the fact that there are 13 companies drilling for oil in Liberia is going to lead to economic transformation. I always wonder what exactly they mean by that. I think it is an old way of thinking. If you look at producing countries from Nigeria to Equatorial Guinea, I don’t think it solves any of our problems, I think it exacerbates them. You’re never going to have trouble raising private equity for a new mine, or for a telecom company or a bank. What you really have trouble with is raising money for companies and industries that are going to employ a lot of people, a lot of them women and young people. Now, you might understand the focus on women, but 68-70 per cent of the population of Liberia is under 35 years old. If we don’t figure out a way to employ those young boys they will figure out a way to employ themselves and I think you know what I mean by that. And that’s continent wide – 70 per cent of Africans in 2015 are going to be under the age of 35. We have to find a way to give those people meaningful employment. Do you think impact investors are sometimes drawn to what seem more worthwhile projects like clean cookstoves? For a lot of people, job creation isn’t a great case for impact investment. There are a lot of impact investors that won’t touch our company because the final product is a T-shirt going to a woman in Santa Barbara, or a pair of pants that is going to be sold in Macys. But if I was manufacturing or designing clean cookstoves, they would be falling all over me with more investments. I find that really bizarre because the market is saturated with things like clean cookstoves now. But at the end of the day, that seems to be an interesting divergence from the impact space. If you’re not creating products for the poor, a lot of people don’t consider it an impact investment.